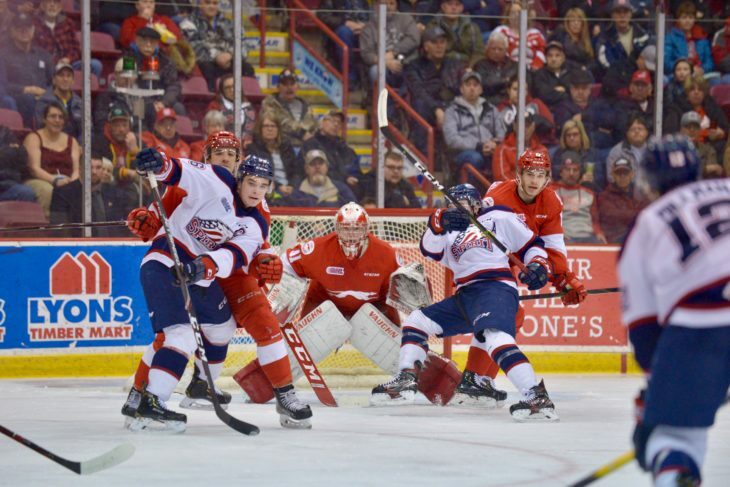 The stage is set for a West Division / I-75 rivalry in the Western Conference Semi-Finals series when the Ontario Hockey League (OHL) playoffs enter the second round tomorrow night (Fri. Apr 5). 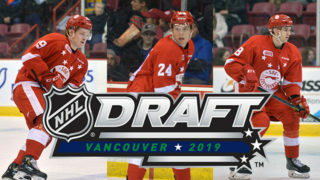 The Soo Greyhounds and Saginaw Spirit will meet for the fifth time, all-time, in the post-season when the series kicks off at the Dow Event Center in Saginaw, Michigan. 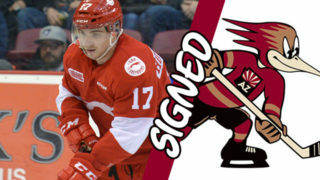 These two teams have previously met in 2018, 2015 and 2008 where the Hounds swept the series in four games, while in their first meeting in 2007, it was a Sault Ste. Marie victory in six games. Most recently, the two teams finished 2nd (Saginaw) and 3rd (Soo) in their conference this season (2018-19), while splitting their regular season series with 4 wins each (full summary below). Saginaw received the West Division crown, and higher seeding, by virtue of accumulating more points (one) in the head-to-head season series. This is the six straight season the Greyhounds have advanced to the Conference Semi-Finals. 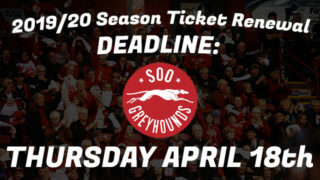 SOO; After dropping the opening game of their first round series, the Greyhounds outscored the Owen Sound Attack 21 to 11 to win four straight (Games 2,3,4 and 5) to advance. 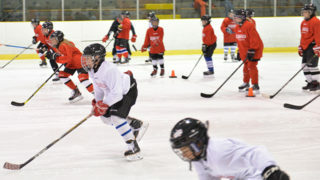 SAG; While the clinching game required overtime, Saginaw completed the sweep of the Sarnia Sting and ended their series with a 5-4 victory at the Progressive Auto Sales Arena in Sarnia. The Godfrey, ON native sports a 4-0-1-0 record to go along with a 2.87 GAA and .895 SV%. At the other end of the ice, Ivan Prosvetov, who had the third-most regular season victories (36) has a 4-0-0-0 record to go along with a 2.15 GAA and .937 SV%. Saginaw holds a higher percentage through the opening round of the playoffs in both categories. The Spirit sit 6th on the powerplay (5-for-19, 26.3%) and 3rd on the penalty kill (15-for14, 100%). For the Greyhounds their mark is 5-for-26 (19.2%), good enough for 10th with the man advantage and 14-for-19 (73.7%) or 11th while shorthanded. 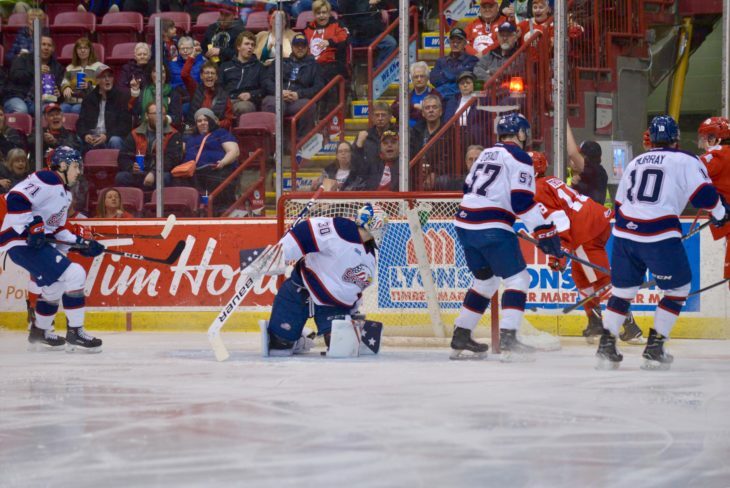 In the regular season, the Spirit were a spot ahead of the Greyhounds in 10th on the PP and 3rd on the PK. 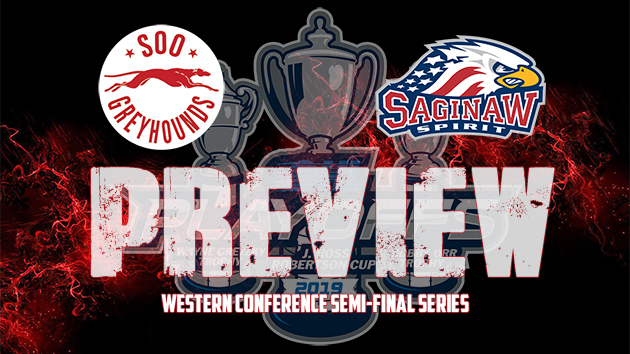 You can catch every minute of the action – every goal, hit, save by tuning into the “Home of the Greyhounds” on your radio dial, Rock 101 (101.3 FM or online HERE) one-half hour prior to game time with the Soo Video TV pre-game show with Gerry Liscumb Jr.
TV coverage locally will only be available for home games on Shaw Spotlight with their coverage starting at 7 PM. Road games WILL NOT be televised. Fans do have the option of purchasing each, and every one of the games in this series online by visiting OHLLive.com, powered by Endeavour Streaming. Tickets for Game 3 (Tues. Apr 9) and Game 4 (Thurs. Apr 11) at the GFL Memorial Gardens are on-sale NOW. Fans can visit the Box Office, presented by SK Group, during regular business hours of 10 AM to 5 PM Monday to Friday, 10 AM to 2 PM Saturday or 10 AM through game time on game days along with ordering conveniently online at www.gflgardens.ca or by phone at 1.866.775.9422. After a see-saw battle to start the year, each team won back-to-back games from December to the conclusion of the regular season. 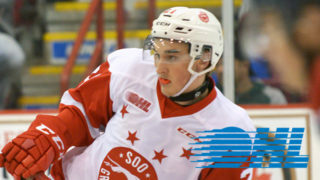 ZACK TROTT had a two-goal night, and DREW WAWROW recorded his first-career OHL goal as the Greyhounds built up a 5-0 lead to pace their winning efforts. Spirit back-up netminder Tristan Lennox made 47 saves on 52 shots in the contest. Saginaw scored first before JAROMIR PYTLIK (10th) left teams tied 1-1 after twenty minutes; Hounds would hold SAG off the scoresheet for the next 59:22 before Barrett Hayton (making his return after 9 games out of line-up) would score at 2:22 of overtime for win. 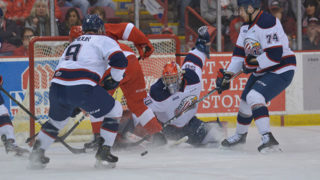 After ZACK TROTT scored just 2:38 into the first period it was all Saginaw; Spirit scored twice to lead 2-1 after the first period, then added two more in the second and an early third period goal for a 5-1 lead; COLE MACKAY at 18:09 and ROBERT CALISTI at 19:48 rounded out scoring for the Hounds.